When a seller is getting ready to sell their home, there are always projects that can be done to make the home more saleable. Removing clutter, touching up paint and a deep cleaning are the most common first step recommended to a potential home seller and increasing the potential for getting a home sold. The steps discussed in this article are the next level and are meant to return the greatest amount of value with the least amount of cost and effort. These steps will also get your house ready for sale at the highest possible price in the shortest amount of time. These are the little things that potential buyers notice and influence their decision to make an offer and how much they decide to offer. Home sellers following this advice are truly ready to sell their home. All potential home buyers will look at your furnace and appliances. Make them shine. Sellers should clean the oven, stove top and inside of the refrigerator as best as possible. Use some appliance touch up paint on small chips and nicks. Use a degreaser on the furnace, wipe off all dirt and dust and clean the floor around the furnace. Buyers will make over all assumptions about the upkeep of the home based on the appearance of the appliances and furnace. I cannot tell you how many clients I have worked with that reject a home based on the condition of the furnace. The condition being entirely determined by the way the furnace looks. Cracking, peeling, and discolored caulk and/or silicon on your baseboards, moldings, sinks and tubs stand out like a sore thumb but a little time and effort can remove the cracked and discolored caulk and silicon. Tubes of caulk and silicon are inexpensive and easy to apply. Sellers will be surprised at the difference this step will make in the overall appearance of the house because nothing looks more dated than a sink with cracked caulk all around it. Discolored, beeping, and non-functioning detectors are eye sores and annoying for buyers. A quick trip to the local hardware store to get replacements for dated detectors and fresh batteries for more current detectors is always a cheap and easy way to add visual appeal and value to a home. Having the chimney and fireplace cleaned helps make a home more attractive to buyers. Although buyers love a fireplace, they fear chimney fires. As a result, water stains inside the fireplace, piles of soot and loose mortar are all troubling signs to potential buyers, so sellers should consider spending a little extra money to improve these conditions professionally and save the receipts for potential buyers. Not only will it further home safety, but will increase the likelihood of a quick sell. Sellers should make sure that all windows have screens. Screens that don’t fit correctly or are damaged should be repaired immediately with particular attention to the screen door. Potential buyers notice those screens first. Of all the things this article recommends, this is the most important. Windows should be cleaned, sills vacuumed, and blinds dusted. There should be no peeling paint, moisture stains or discoloration as all of these are warning signs to potential buyers. Scrape, sand, etc. your problem sills and put a fresh coat of paint on them. 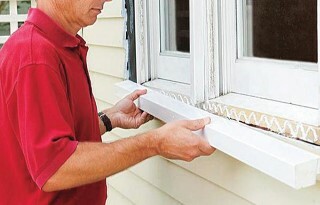 Sills are so often overlooked by seller, but not by buyers. Now that the seller has completed his deep cleaning, removed clutter, touched up paint and followed the steps in this article, they are ready to go to market with a house that is truly ready for potential buyers to see and truly ready to sell.